Things are going to get a lot chillier in Fortnite. What started as a mysterious white cloud in the distance has revealed itself to be an iceberg. Not only that, but it is an iceberg that has its sights set on the Fortnite island. While Epic Games is remaining silent, it appears that Season 7 of Fortnite will be quite the winter wonderland. The whole saga started when players began to notice a mysterious white cloud (that wasn’t there before!) in the distance. Many began to speculate about what it meant, but the running theory was that a snowstorm was on its way to the battle royale. However, when some players managed to get a closer look at the thing, it was discovered that the cloud was hiding an entire iceberg! Is anyone else getting shades of the Cube Saga? I’m totally getting shades of the Cube Saga. Curiously, in the image of the iceberg (do we have a name for it yet? ), you can see what appears to be a building of some sort sitting on top of it. We’ll likely find out more as we get closer to the start of the season. For now, though, everything remains a mystery. As is par for the course when it comes to upcoming seasons, Epic is staying mum on the matter. But it appears that Season 7 will have some kind of winter theme, just in time for the holiday season. This would follow the Halloween-appropriate theming for Season 6. The question is, if snow does get added to the Fortnite map, how would that change the game? 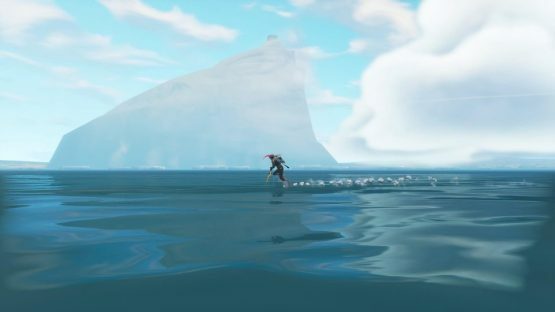 What do you think the iceberg will bring to Fortnite? Could it be hiding an even grander building inside of it? Let us know in the comments below!